Australian brush turkeys incubate their eggs in places most animals would stay clear of: moist piles of rotting vegetation. There are some advantages to this approach, most notably that the heat released by the microbes keeps the eggs warm but those same microbes can also get through eggshells and kill the embryos. 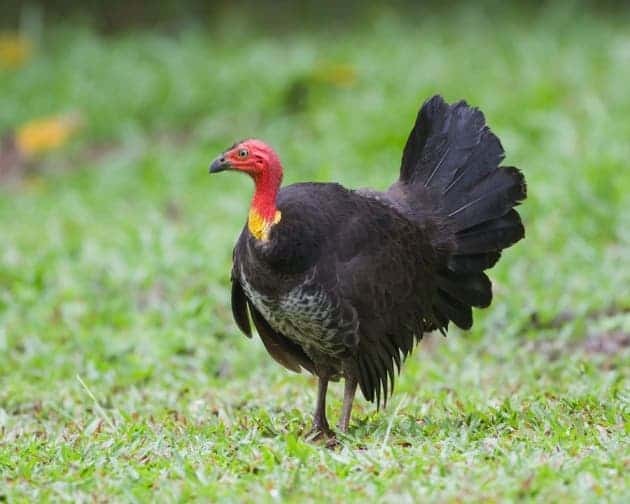 However, even though the risks are apparently huge, only 9% of eggs laid by Australian brush turkeys (Alectura lathami) are infected. Researchers now believe they know why this happens: the shells are covered in a layer of nanometre-sized spheres of calcium phosphate, which makes them repel water and harder to crack. The results are extremely promising, with potential applications in antimicrobial coatings for plastics and other surfaces. It’s generally pretty tough for microbes to crack through eggs. Most eggs have a tough barrier for pathogens to crack, and even if they do breach the eggs’ defenses, they are met with antimicrobial enzyme called lysozymes, found in the whites of bird eggs. But brush-turkey eggs have just as many lysosomes as chicken eggs, and more interestingly, their eggs are 1.5 times thinner than those of chickens – so how is it that their eggs are more resistant to infections? The key difference is the ability to repel water. While chicken eggs absorb some of the water, brush-turkey eggs repel it. Since most microbes are usually transmitted into eggs by moisture, they are basically rejected by this hydrophobic layer. This hydrophobic layer also works as a mechanical defense, aside for the biological protection it offers. The properties of this layer are achieved through calcium phosphate nanospheres, which are pretty uncommon in birds. Understanding how these nanospheres work could help to create better antimicrobial coatings for use on a wide range of materials, and ultimately to many more applications in biomedicine. “Hydrophobic nanoparticles on the surface of medical devices could change the way bacteria adhere or form biofilms,” says Matthew Shawkey, an evolutionary biologist at the University of Akron.